One Bedroom, Sleeps 2, Close To Town Center And Restaurants. Experience authentic Santa Fe in this one bedroom (1000 square foot) casita located in the historic Guadalupe district. It is optimally situated next to the Railyard District, the burgeoning new hub of the city, and not far from the Plaza. Whether you would like to take the Railrunner to Albuquerque to view Balloon Fiesta, the scenic train to Lamy, ski, mountain bike go to the opera, shop in the open air market, visit the art galleries, dine in traditional New Mexican fashion, or much more; you are not far away. 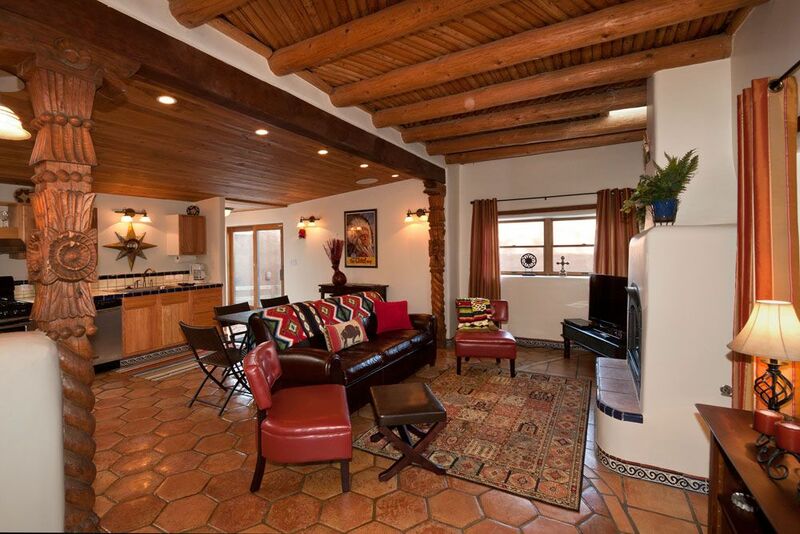 Enjoy living in a traditional adobe with vigas, latillas, nichos, and a spacious portal to bring the outdoors in. It has a large bathroom featuring Mexican tile, a large spa tub, and shower. It is decorated in typical Santa Fe style allowing a relaxing, introspective stay with two outdoor courtyards and four skylights. You won’t miss out on the modern conveniences with a 40 inch LED HDTV, blueRay player, NetFlix, high speed internet, iPod speaker system throughout, iPod docking alarm clock, covered parking, washer/dryer, and a luxurious queen size bed and sleeper sofa. Guide book for guests available in casita and online. Owner/manager available for recommendations of local activities, and will stock casita, for arrival with groceries, for additional fee. Interior design professional. Enjoy scrapbooking and collecting antiques. Colorful bathroom with large jacuzzi tub and separate walk-in shower. Located in the Historic Guadalupe district, 0.5 mile from the Railyard District, and 1.0 from the central Plaza. Front and back walled courtyards. Large front portal, and rear deck. A nice stay in Santa Fe. We enjoyed staying at the house... quite nice, very restful. We were conveniently located to Santa Fe's many attractions. Barbara offered much guidance to my daughter and I as we planned our daily activities I would recommend this home and experience to others. Perfect for my wife and I. Close, but not TOO close, to all the major sites of Santa Fe. Bed was comfy and the fireplaces were quite welcome on cold March nights. The Casita had a great location to lots of restaurants and downtown Santa Fe. It was very clean and well supplied. Loved the southwestern architecture and decor. My wife and I celebrated our wedding anniversary in Santa Fe and chose this property for our four night stay. We found the property as advertised and were very pleased. The pictures hardly do the Casita justice. The Casita is located in perfect location for exploring Santa Fe. We loved the decorating touches and the bathroom tub/jacuzzi was just what was needed after a long day of exploring. The kitchen was well stocked and had everything needed to prepare meals. We would, and most likely will, stay here again. No tax on monthly rentals -- a savings of over 15%. See rental agreement for details cancellation policy. 100% refund if more than 60 days before the rental starts (less $75 service fee). 50% refund of total rental amount if between 30 to 60 days (less 75$ service fee). No refund if less than 30 days.